suburban banners for the sake of banners: cartoonish sunrise, frog. What do you like? What do you like? The anniversary of seeing children swinging from trees remembering swinging from trees is at heart a bleed of anniversaries. If you were born Christmas Day you share a birthday with Isaac Newton and Sissy Spacek simultaneously. Inlets bleed. With each of my entries in this poem, I found myself adding these short, parceled-out, elucidations and commands, and I realized it was a different voice. The chorus kind of talked back. Overall, I think one of the most challenging and surprising aspects of writing this book was that it was a kind of tug of conscience for me to enter from a new place formally with each poem, in order to necessarily do my hearing as well as what I didn’t hear justice. The choral gave me new ways in where voices emerge and differentiate and interstice and expand, but I didn’t want its force to be the force of a crowd. I had to find a way for language to be able to reference actual lives in the context of what is not referenced too, to mention things unspeakably embedded and complex in actual lives, with actual camellia bushes and layoffs and children and hopes and the 9/11 “anniversary,” which I didn’t want to merely report in stillness or claim an unfounded authority of report. I felt the danger of both over-speaking and under-speaking, and as a result the particular entrance point for lyric felt like a very tenuous easily slipping place; there is a series of poems necklaced throughout the book that explore this idea of “slippage,” which were especially challenging to write because I was writing at and from that point at the same time. I think one reason the chorus allowed me to navigate here is that although the chorus is active, it is distinct from the actors. The chorus is there beside the actors while in the same viewer space. 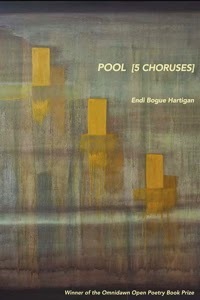 Purchase Pool [5 choruses] HERE.